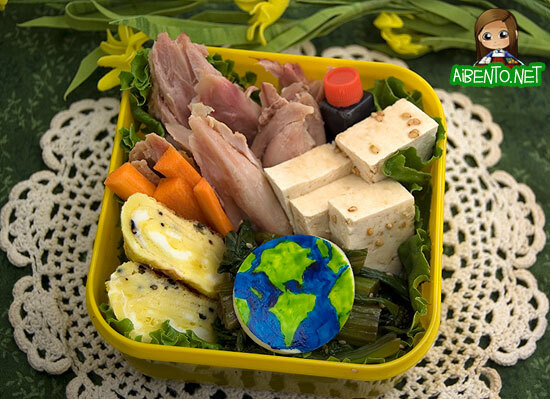 I had meant to post this on Earth Day, since I made it and ate it yesterday, but I was so busy I just didn’t have the time. The Mog House Decorating Contest we’re having over at ZAM has taken up all my free time, so much that I almost went insane processing entries. I whipped this lunch up extremely quickly, mostly because everything except the Earth was already made. The chicken is rotisserie chicken from Costco, there’s tofu slices, sesame choy sum that I made the other day, tamagoyaki that I made for my Sayid bento, but couldn’t find room for, and some little carrot sticks. I think this took me just over five minutes to pack, then I had to make the planet. The tamagoyaki has leftover Sayid cheese and roasted sesame seeds in it. Yum! I was lacking red, so I added a bottle of soy sauce for the tofu, though I could have just eaten it with the choy sum and that would have tasted fabulous. 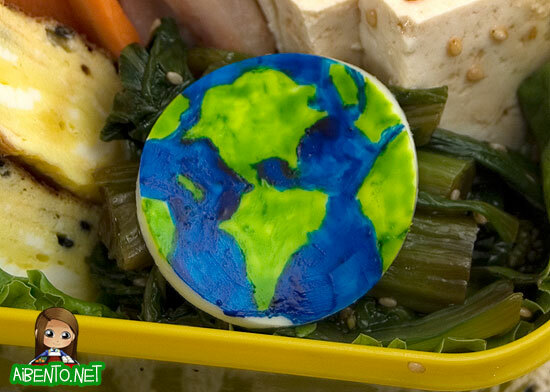 To make Earth, I simply cut a circle out of white cheese and painted the land and ocean with toothpicks and neon food coloring. When I showed D at work, she’s like, “Where’s Hawaii?” Of course I didn’t forget to put us on it, you can see the little green islands in the middle of the Pacific, right? Earth tastes good, by the way. The announcement of my 1M Hits Bento Contest will have to wait until next week, as I have to list the 350+ entries before choosing my winners! My apologies for the long wait, but this is the biggest contest and biggest response yet!